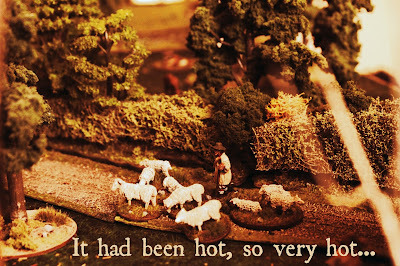 It had been hot, so very hot; the best summer for a generation said many. 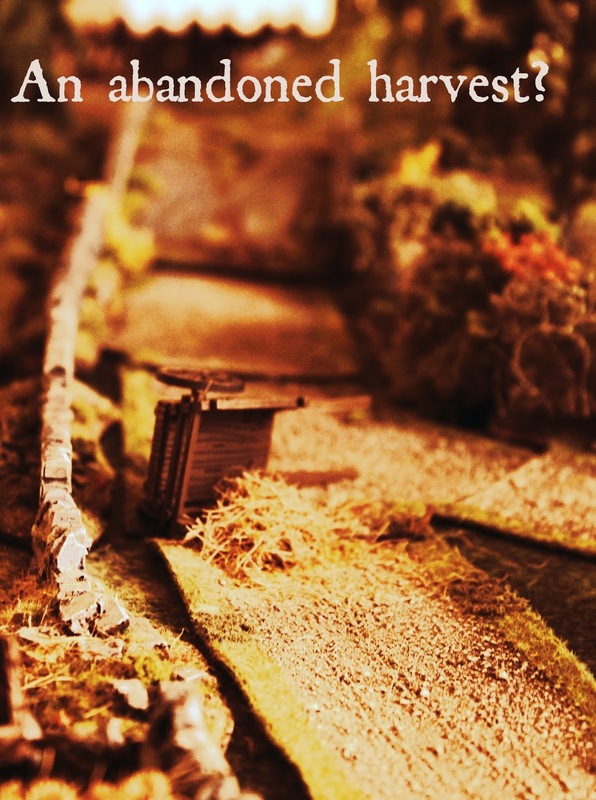 The crop had been bountiful and with the last sheaths of wheat loaded on to Windy Miller’s cart the villagers of Muchwhinging looked forward to slaking their first with a flagon, or three, of ale. As daylight started to fail, the stifling heat did little to dispel a sense of foreboding that many felt. Birdsong gave way to a shrill cry that got louder as the exhausted lungs that carried it near-burst with exertion. "Sit yourself down and catch your breath lad; what’s all this fuss about, eh?" The reassuring words of Richard Marshall doing little to appease the scrap that sat in front of him. The young boy, took a sip of water from the tankard, but his trembling hands could not maintain sufficient purchase and it fell to flagstoned floor, shattering the unfamiliar silence within the 'Slaughtered Lamb'. The unwitting messenger slowly raised his head, expectant eyes bore into him, but the only words he could utter would cause the thickest of hairs to stand proud, "They... they're back!" The hour is nearly upon us and the preparation is all but done. 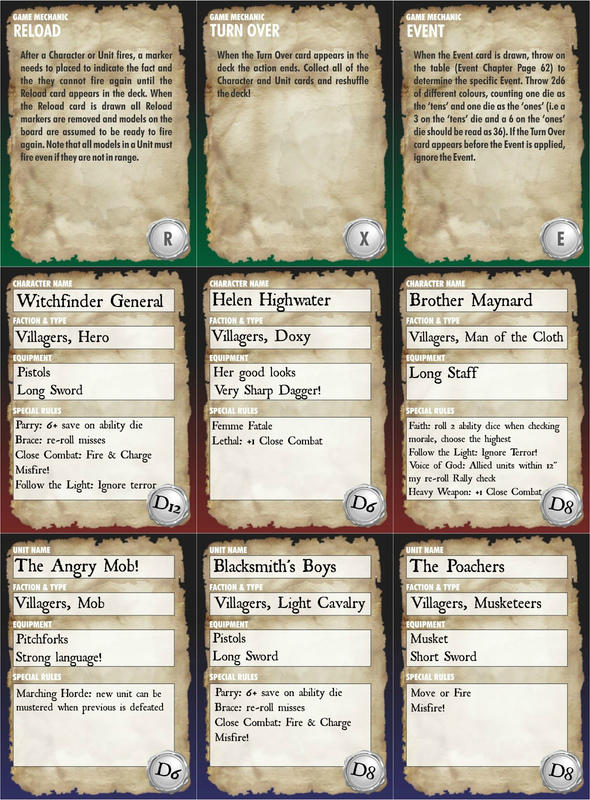 Tomorrow's game is inspired by ‘Witchfinder General – Days of Revelation’ and brought to the table by using a pared down version of ‘Donnybrook’. 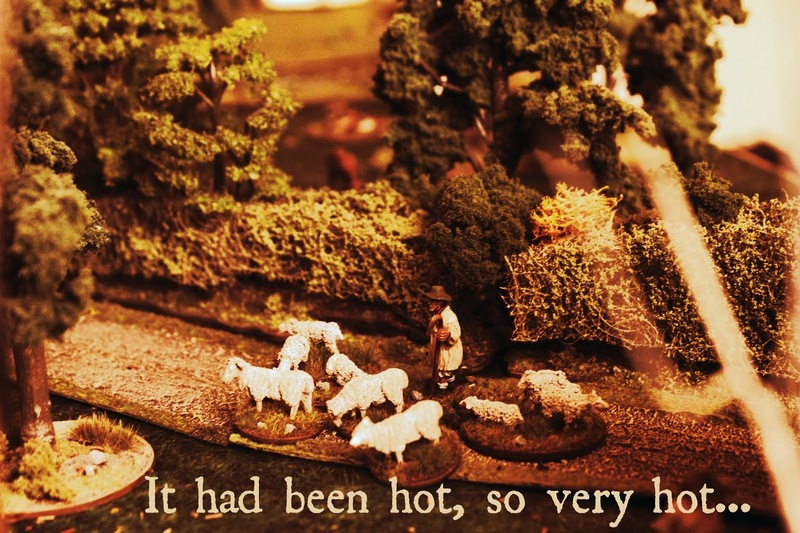 Given that this is new to all taking part we have chosen a simple encounter scenario whereby the villagers of Muchwhinging set out into the gathering gloom to do battle with the vile abominations that have returned to their lands. A lot of fun has been had getting to grips with the rules, which appear simple, yet brutal, benefitting from a good deal of narration and a fair sprinkling of common sense. I have had a couple of run throughs in preparation with some hilarious outcomes as the events have taken a completely unexpected change of direction on the turn of a card. I have had to par down the game a little, mostly because I didn't have enough troops to field both sides, but followed the rules for setting up so hopefully it will be a balanced encounter. I have also invented a few characters, combining elements of Witchfinder with Donnybrook factions, allowing me to field some of the more esoteric models in my collection. 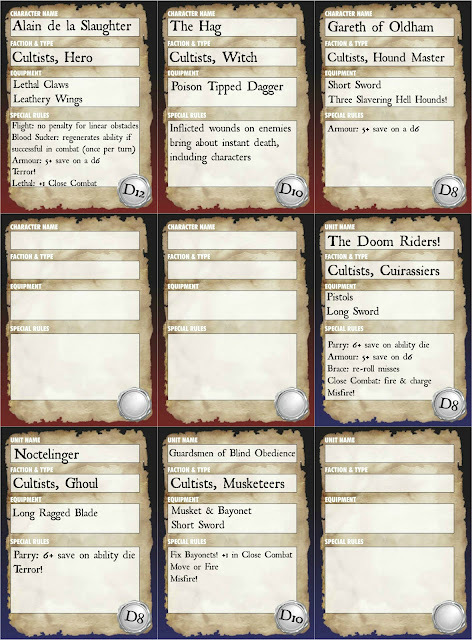 Using the downloadable cards from the 'League of Augsburg Blog', I was able to add as much character information as possible, so hopefully that will help to keep the came ticking along. Now provided, I remember to take some photographs, and jot a few notes down, then there should be a battle report before too long. Absolutely chaotic, but great fun! Should be a glimpse up shortly. Ah! It will be great Michael! Sort of, but as usual I didn't take enough photographs. Thank you Frank, some pictures on the way. Gorgeous eye candy in this intro Michael, and from the info on the cards it looks set to be a cracking game! Thank you, we managed we goes of the same scenario and had an absolutely blast 0 great fun, very silly. Brilliant pics look forward to reading more. too bloody hot by half if you ask me! 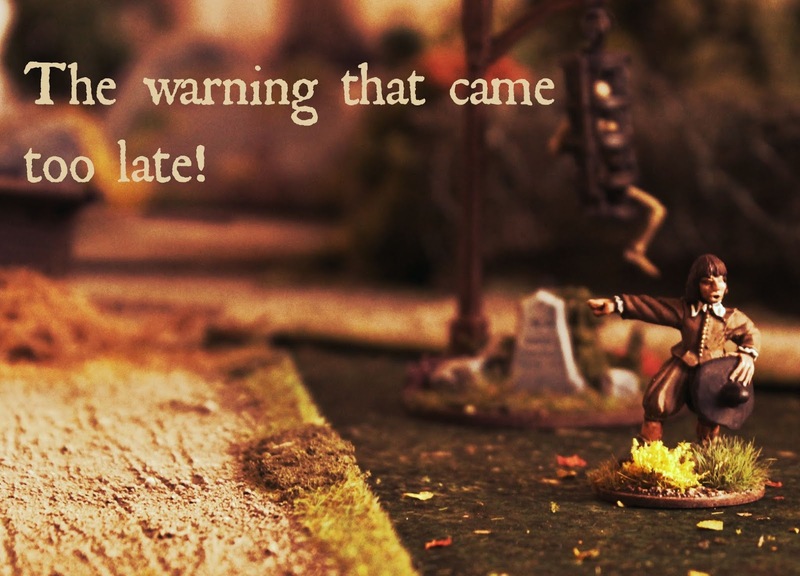 All rules follow (I hope) the wishes of the rules designer. While I do like Donnybrook I found them just a little in lacking in flavour for me. Others will disagree I am sure and each to their own choices. But for me Donnybrook were too "Light"
I know exactly what you mean Clint, they are certainly not for everyone, but worked perfectly for us. Really looking forward to this, it's going to look great! Thank you, I have just put some photographs up now. Oh this should read wonderfully and look even better!! Thank you, didn't really make enough notes, but did take a few photographs. The boding is definitely to the fore. I'm looking forward to the AAR! It was a fabulous day Dave, thank you. Wonderful story line and provoking images, Michael! Thank you Dean, there should be a few more up now. Looking forward to seeing how this turns out Michael. It was a lot of fun, great day's gaming. This should be good, some of the characters have interesting equipment. Helen Highwater - her good looks. The Mob - Strong language. 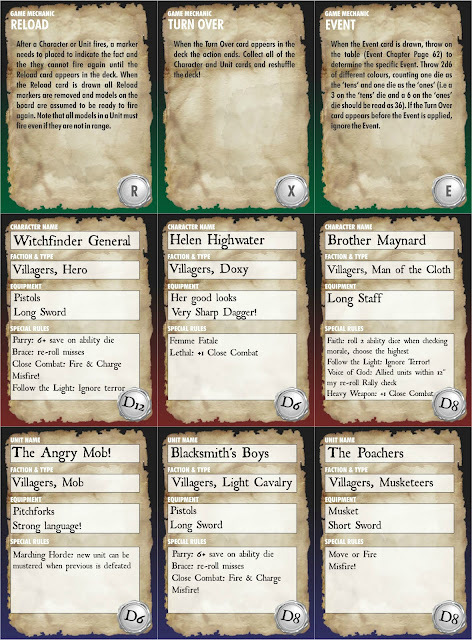 Are these Witchfinder attributes or Donnybrook, I've not read either ruleset. Hopefully you will give some rule detail, I'm interested to know how strong language works, it sounds an ideal rule. I may have overdone some of the notes for comedic value! Helen is using the Doxy rules and the Strong Language simply alluded to the fact that they were so poorly equipped. I brought over some of the names from Witchfinder and created a couple of my own rules, but feel free to ask any questions. The scene has been well set, I'm already hooked.